Please see the list below for current volunteer opportunities with our member organizations. If you are a Green Umbrella member and would like to submit a volunteer posting, please send it to greennews@greenumbrella.org. Join us every month for a fun workday on Imago’s nature preserve. You’ll join others to plant trees, work on trails, and beautify gardens. Reforest NKY is organized by the NKY Urban and Community Forestry Council to restore native Kentucky woodlands. The reforestation project is responsible for planting thousands of tree seedlings on previously mowed properties in Boone, Kenton, and Campbell counties. This event is an opportunity for public education and awareness about the importance of trees in our region. Major Sponsors include: Great Lakes Brewing Co., DHL and NKU Mayerson Student Philanthropy Project. By planting trees, our forest landscape and legacy is restored. Trees and forests provide significant, measurable benefits to our communities, improving the environment, economy, and our quality of life. Over the last ten years, more than 40 acres of previously mowed land has been planted with native woodland trees and over 2,500 volunteers have participated in Reforest Northern Kentucky. Driving Directions: From Independence KY, go south on KY-17 (Madison Pk). Continue south through the KY-16 intersection. After an “Atwood” community sign, turn east (left) on KY-2042 (Moffett Rd). After 5.2 miles turn right on Kenton Station Rd (which is still KY-2042). Turn right on KY-177 and drive south about 5 minutes. Look for the preserve’s parking lot about 1⁄2 mile south of the KY-14 intersection where there is a Morning View Post Office. There is no sign yet but the new gravel parking lot is on the west side of Decoursey (KY-177), on the opposite side of the road from the railroad track. It has 2 entrances. A black barn with sign is obvious behind a wood fence. For further information, contact Rhonda Ritzi at (859) 525-PLAY (7529) or reforestnky@nkyurbanforestry.org. The Clermont Soil & Water Conservation District (SWCD) and Valley View Foundation are pleased to coordinate the 2019 Spring Litter Clean Up, scheduled for Saturday, April 13, 2019 at various locations across Clermont County and the East Fork Little Miami River watershed. The year's event will kick-off with a T-Shirt Design Contest for all local K-12 students! Please see the registration page for more info and to register: https://www.springlittercleanup.com/2019-t-shirt-design-contest.html. The Spring Litter Clean-Up is an annual volunteer event held in many communities across Clermont County and the East Fork Little Miami River Watershed. Each year, volunteers come together to enjoy the outdoors, while also doing their part to keep litter out of local parks, streams, and lakes. Volunteers of all ages walk their neighborhoods or use canoes to collect litter to help keep our open spaces and waterways clean and safe. It is inspiring to see so many people come together each to year to protect the treasures that make Clermont County and the East Fork watershed a special place. This year's event is being sponsored sponsored by the Clermont County Convention & Visitor's Bureau, the Duke Energy Foundation, and the Southern Ohio Association of Realtors. The East Fork Watershed Collaborative (EFWC) is a watershed group that was formed in 2001 to help communities restore and protect the East Fork Little Miami River watershed. The East Fork Little Miami River is considered an exceptional water resource in Ohio and the EFWC works with partners in Clermont, Brown, Clinton and Highland counties to develop plans and projects to protect the river. The EFWC includes representatives from local government agencies, community organizations, and residents. Clermont Soil & Water Conservation District (SWCD) is the lead agency for the EFWC. The Valley View Foundation (VVF) is a grassroots, nonprofit organization whose mission is to conserve land, preserve history and share it with the greater Cincinnati community. In 2002, a group of citizens had the vision and dedication to save one of the last family farms in this area to serve as a nature preserve and education center. Since that time, thousands of volunteer hours have made it possible for the VVF to establish permanent conservation of 190 acres along the East Fork Little Miami River, preserve local history, restore two historic barns, maintain five miles of trails, develop a thriving community garden and increase the number of visitors from local schools, scout troops, businesses and government leaders each year. Other Important Event Partners include: Clermont Soil & Water Conservation District (SWCD), Clermont Office of Environmental Quality, Clermont County Park District, OSU Extension, Ohio Department of Natural Resources State Parks and Division of Watercraft, Highland SWCD, Brown SWCD, Clinton SWCD and many others. For more than 30 years, Great Parks, Forest Park Environmental Awareness, and hundreds of volunteers have removed tons of litter in and around Winton Lake. Join us on 4/13 at 9am for the cleanup and stay for a grilled lunch and nature program. A special prize will be awarded to the high school with the largest group! Come help us implement a new permaculture site in Lincoln Heights! Volunteers will help plant fruit trees, flowers, and other vegetables. Lunch will be provided. As part of the City Of Cincinnati Government's Year of Living Sustainably, please join us for our first #TrashTagChallenge neighborhood cleanup! At 9am on the first Saturday of every month, residents of East Walnut Hills, Evanston and Walnut Hills will gather in a meeting spot in one of these neighborhoods and, following the advice of community stakeholders, select an area to clean up. For the first cleanup, we're meeting at Cafe DeSales on the corner of Woodburn Ave. and Madison Rd. Are you interested in wildlife habitat, nature education, outdoor recreation or customer service? Would you like to make a positive difference in the environment or help connect people to nature? Join us to learn about the many fun and exciting ways you can get involved. For ages 18 and up. Free, register by 4/9. Volunteers are invited to help with riparian plantings along the banks of the East Fork LMR on Saturday, April 6th (from 10:00 a.m.-Noon) to support recent dam removal restoration activities. Lunch will be provided. This will be a fun morning! Kenton County Parks & Recreation will facilitate the annual Doe Run Lake Clean-Up, as part of the Keep America Beautiful Great American Clean-Up 2019, presented by Keep Cincinnati Beautiful. The clean-up will begin at 9:00 A.M. on April 6th, 2019 and last until noon. 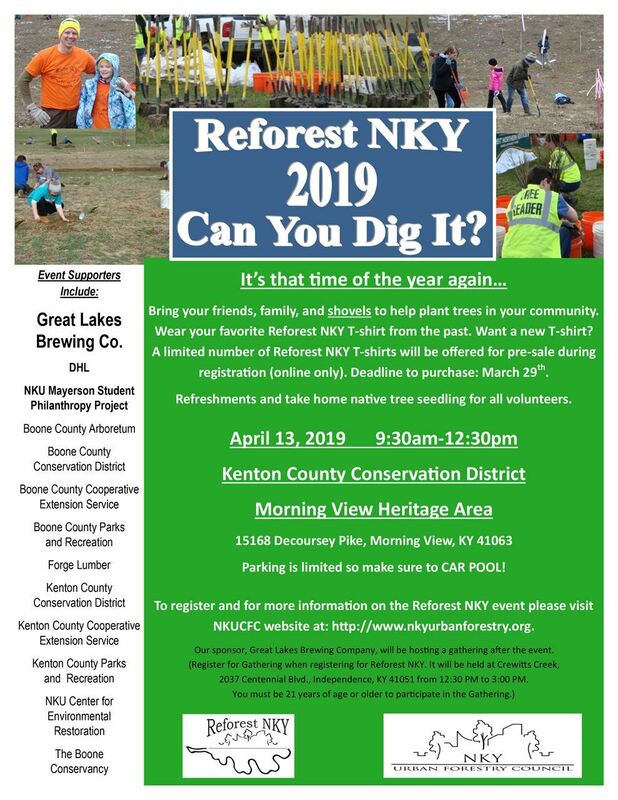 This event provides citizens an opportunity to ‘Make a Difference’ by picking up trash and litter and to explore one of the last remaining public natural areas in Kenton County. By ridding neighborhoods of litter, illegal dumping, and graffiti, we are creating a clean and safe place to live, work, and play. Join us to make a difference! Rubber gloves and trash bags will be provided. Wear boots or old shoes and old clothes. It will be messy! Volunteers will collect and remove everything that should not be found in a County park, including trash, construction debris, automobile and truck tires, old fishing line, and an odd assortment of other objects not usually associated with nature and the outdoors. There will be a restroom available. There will be a ‘Most Unusual Find’ contest again this year. One year, it was a bowling ball; another year, it was two halves of an electric guitar! Need community service hours? Rhonda Ritzi, the Recreation Coordinator, will be happy to sign any paperwork. Help your friends and neighbors make a difference! Doe Run Lake is located at 1501 Bullock Pen Rd., Covington, KY 41017. Take the Covington/Independence (Exit 80) off I-275. Go south (away from Covington and under I-275) on KY 17 (Madison Pike) about one mile. Follow the signs. Volunteers should meet in the parking area near the boat launch. For additional information, please call 859-525-PLAY (7529).